The bathroom is a place in which many of us spend quite a lot of time. From getting ready for work in the morning, to washing away the cares of the day before bedtime, it plays an important role in our daily routine. Yet some of us are still living with outdated, ugly looking bathrooms. We may not even realise the effect that waking up to an ugly bathroom is having on our overall mood. But never fear – there are lots of different ways to update and improve the look of your bathroom, giving it a fresh, modern look which you’ll be able to enjoy, every day. We all clean our bathrooms, but how many of us get to those really stubborn spots? Places like behind the toilet and underneath the rim of the sink are prime places for dirt to collect. Before modernising your bathroom, make sure you get into all of those hard-to-reach places with a good, bleach-based bathroom cleaner. Windows let light into our home, and dirty windows will prevent this from happening. To modernise and freshen up your bathroom, you should make good use of natural light by allowing as much to come in as possible. Like it or not, bathroom floors are a prime place for germs to collect, and, unless your bathroom floor is perfectly tiled and easy to keep clean, you may wish to consider replacing your bathroom floor every few years. Laminate flooring is an inexpensive option and incredibly easy to lay. Not only that, but it will give your bathroom an ultra modern look. Modern bathroom design is all about accessorising. Bathrooms often end up being strewn with towels, soaps, toothbrushes etc., and if you can manage to co-ordinate these items your bathroom will look ten times better. Match your towels to your bath mat and, if you have one, shower curtain. Lighting can make all the difference to your bathroom, so make sure your bathroom is lit as well as possible by installing a mixture of spotlights, downlights and even illuminated mirrors & bathroom cabinets. Not only should your bathroom lighting make your bathroom look great, but it should also make you look great. For extra points, install a dimmer switch so you can create a romantic atmosphere for those cosy evenings in. As mentioned above, bathrooms have a habit of getting messy. And if there’s more than two people in the house, this mess can sometimes get out of control. This is where great bathroom storage comes in. Modern bathrooms tend to integrate storage into the overall design layout, sinking sinks into cupboards and hiding cabinets behind sleek, sliding mirrors. This is less of a step, and more of an injunction. If you want to make your bathroom look as modern as possible, it’s best to keep your design simple. Decals on tiles are dated, as are floral wallpapers, and too many colours will make your bathroom look agitated and over-busy. If you want to incorporate colour into your bathroom, do so in a way which won’t dominate the room. Soft colours can be used throughout, as long as they are complimentary, but bold colours should only be used as accents or features. And anything which can be put away, should be. Linens, towels, bottles, lotions, medicines – all of these things will make your bathroom look cluttered if left lying around. 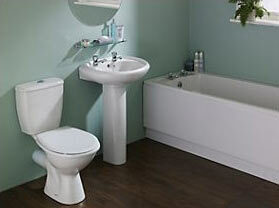 So make sure your bathroom storage is adequate, and make sure you have a good clean out on a regular basis.